The three basic necessities that every human being needs are food, clothing, and shelter. These three needs of any human being make up the physiological needs of a person as stated by Maslow in his famous hierarchy of needs pyramid. When talking specifically about shelter, one needs a roof over his head and a place where to in peace with family. Shelter basically defines your home, a place of security where you can rest and sleep after a hard day’s work. Various studies suggest that an average human being needs from between 7 to 8 hours of sleep. If an individual does not get this amount of sleep, they may not be properly rested and thus, in turn, their ability to work and function properly throughout the day would be compromised. As much as good sleep is a necessity to work and function properly for any person, the mattress you sleep on also plays a vital role in the type of rest you are getting for the night. It is crucial that you choose a mattress that would not hurt your back and allow you to get a good night’s sleep. Choosing the wrong mattress or sleeping on a mattress that is worn out has also been linked to people developing posture problems. It is very important that you identify the right time to get rid of your old mattress and the time to purchase a new one. 2 Should You Throw Away Your Old Mattress? 3 Where To Donate Used Mattress? If you are confused about the right time to change your mattress, then here is a little help. Any mattress that is between 7 to 10 years old should be replaced. Various studies have suggested that mattresses have an average life of 8 years. 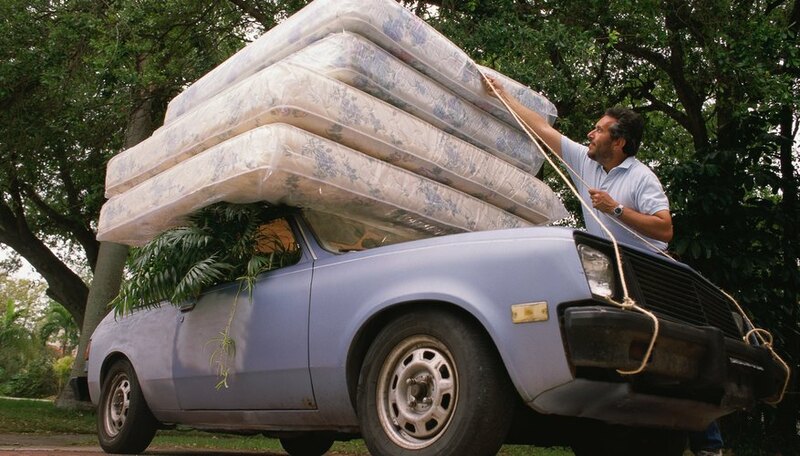 As mattresses also go through wear and tear, they should be changed timely. These are mattresses that have your body marks on them when you get up in the morning. This body “dent” in the mattress is a sign that you need to replace it and get a new one to prevent getting aches and pains. Whether your mattress is old or new, ensure that the mattress you are buying or the one you own, aligns your spine. This would ensure that you do not sleep in an uncomfortable position due to which you may wake up stiff and sore. Should You Throw Away Your Old Mattress? If your mattress is no longer useful for you, then someone else might benefit from it. So, instead of just throwing it away, first think about donating it. Look for the warning signs that your mattress is getting old or would not be of any benefit to you and donate to a place, charity or someone who would use it. Your used and donated mattress may be beneficial to someone else, if not to you. Where To Donate Used Mattress? Confused about where to donate a mattress? Here is a list of 5 places where you can donate your used mattress. This particular organization is an NGO. The National Furniture Bank Association usually collaborates with schools, churches, agencies, and individuals who are willing to donate any piece of furniture that is of no use to them. This NGO then works as an intermediary between these institutions and deserving people and transport the donated materials to them. The National Furniture Bank Association charges a very nominal amount or no price at all for the material that it donates to people who are in need. Apart from this, this particular association also primarily works to facilitate the living of needy people. The National Furniture Bank Association is catering to hundreds of people living in the United States and Canada. Despite donations, still, an estimated 100,000 plus people do not have a mattress to sleep on, out of which 40 percent are children. So, instead of throwing out your mattress, donate it to National Furniture Bank Association. You can check out the list of Furniture Banks in your nearby areas and donate your mattress. Almost every community is home to at least one shelter that caters to homeless people. These local shelters for the homeless are usually short of funds, and they mostly rely on donations from private individuals or the government to function their local shelters. These shelters for the homeless are always in need and are accepting donations throughout the year. You can donate your old mattress to any local shelter that is near you. Search up on the Internet for any local shelter for the homeless near you and donate your used mattress to them. Even if it is worn out and you think it is good for no one, you have no idea what that even worn out mattress would mean to someone who doesn’t have the finances to afford one. Just like a shelter for homeless people, a church or other such religious institutions are great destinations where you can donate your old mattress. Churches and religious agencies are continually working day and night. They aim to collect donations for those people who are really deserving and in need of these basic necessities. Food, clothes, books, or other such pieces of donations are always welcome by them. Thus, this is another opening as to where you can donate your old and used mattress. By donating to them, your old and used mattress would be donated or passed on to someone who is in need of it. In today’s era, it is not necessary to personally visit the donation site where you would like to donate your mattress. Many online services are now also operational that pick up your donated item from home and take it to a local shelter, church, or any other NGO. One online service that is operating in this particular way is DonationTown.org. Basically, this company in question is an online directory that helps people, who want to donate, find nearby donation centers like a church, NGOs, and other such institutions. The company then picks up your donated material, say, your old and used mattress and takes it to your selected nearby charity institute. Also, these are free transits. Many mattress removal services just pick up the mattress from your home, and you’ll only need to pay a small amount. After that, you need to schedule a day and the time for when you would like your old and used mattress to be picked up. This is a hassle-free way of getting rid of your mattress. Also, you can ask these mattress removal services to pick up the mattress from your doorstep and donate it to your local shelter for the homeless, any NGO that is operational near you, or any other such institution that accepts donations and then passes these donations on to the people who really deserve it. Also, read How to Clean a Mattress? Now that you know where to donate a mattress, you can help someone in need by giving him or her your used mattress instead of just throwing it away completely. However, bear in mind the fact that these are not the only places where you can donate your mattress. By searching more online, you might be able to find even more places where you can donate your used and old mattress. Through donating, you just do not throw out your mattress because it is no more beneficial to you. Instead, by donating, the same mattress may be used by someone who is in real need of one. Thus, always consider the donation aspect as it would cost you nothing. Also, bear in mind the warning signs of when you should change your mattress so that you yourself can get a new one and when you will donate, that used mattress of yours is in a usable condition.